Tagged under Kaleido Star, Waifu, Blue Eyes, Long Hair, Blonde Hair. The Kaleido Stage's top star - at least until Sora Naegino enters the scene. Layla is highly competitive and doesn't approve of amateurs, giving Sora the cold shoulder at first. Proud and elegant, she is among the best circus performers in the world, and is well-known for her "Golden Phoenix" trick. Her partner is Yuri Killian, whom she is close friends with. Layla is also very rich and stars in other projects besides the Kaleido Stage, such as movies and Broadway shows. 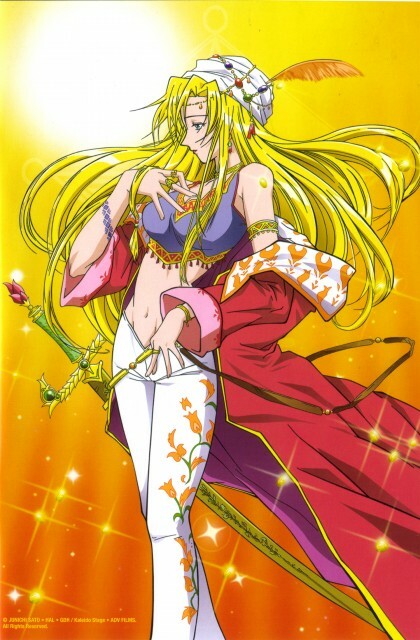 The second OVA, "Legend of Phoenix ~Layla Hamilton Monogatari~", focuses on Layla's desire to leave the past behind and reinvent herself for her upcoming Broadway role as the Phoenix.